Is there a reason why I see third party apps twice. Setting the Intent. // ACTION_OPEN_DOCUMENT is the intent to choose a file via the system's file browser. 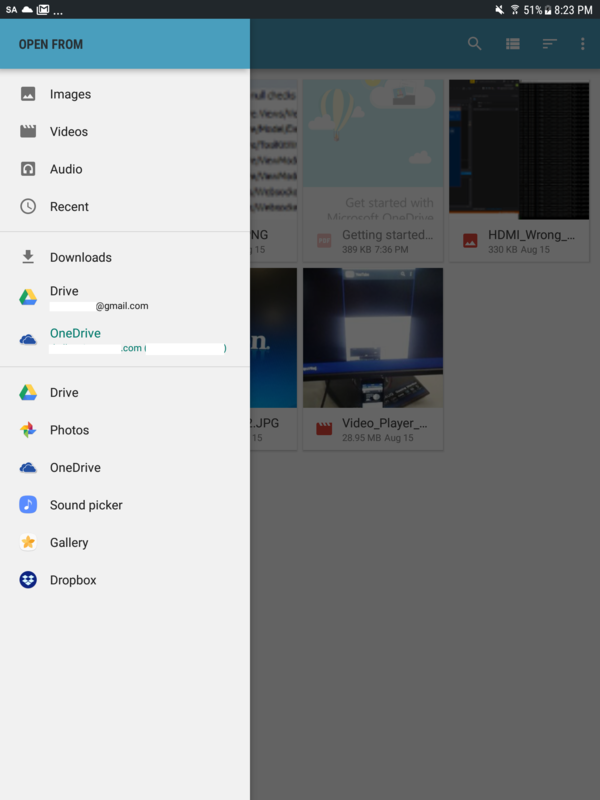 When the Intent Action is OPEN_DOCUMENT, only the first two Drive and OneDrive options are displayed, like in @RajKulkarni.0951 's screenshot, but apps like Dropbox don't show. When the Action is GET_CONTENT, I get the Dropbox option, but with the duplicated Drive and OneDrive options as well. I'd prefer if all the cloud services showed up when the Action was OPEN_DOCUMENT since it grays out the documents with MIME types that I don't want, but the duplicated options seem to open in their respective apps and allow the user to pick MIME types I don't support.